I always find nourishing comfort in soup. If it’s a soft smooth blended soup or a clear broth, it does not matter I am deeply in love with soup. 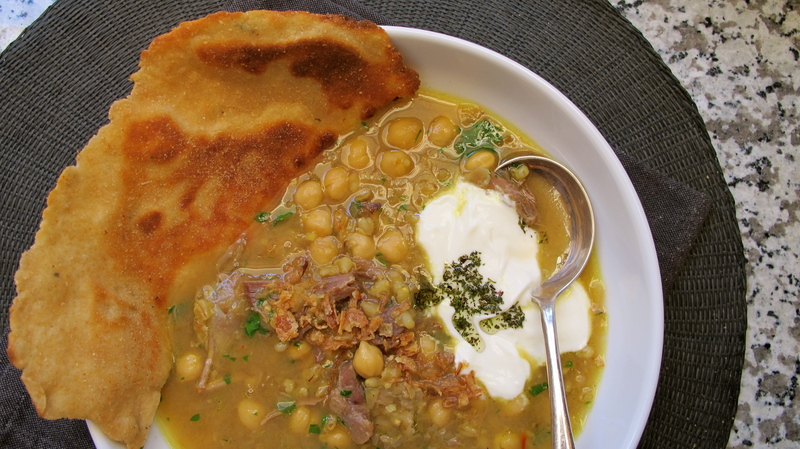 This Persian-inspired soup is a broth of slow cooked lamb with chickpeas, pearl barley and onion. 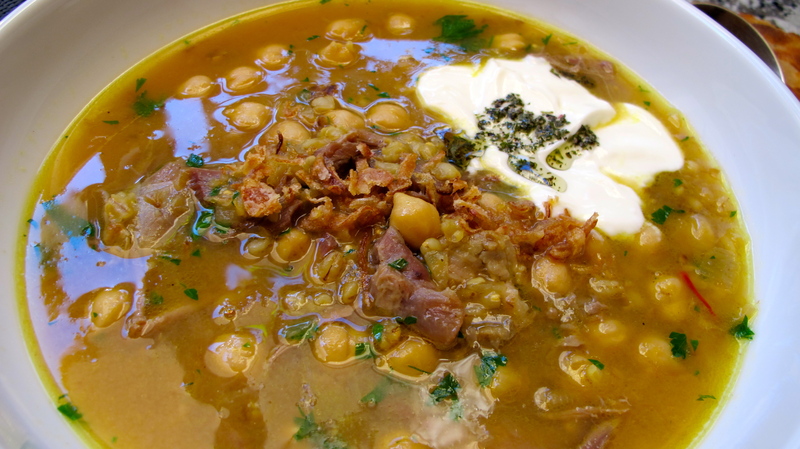 Simple flavours that remind me of soups my mother used to make for me as a child. These yoghurt flatbreads have become a regular fall back at my place. Mainly due to the fact that I always have the ingredients to hand and they are a cinch to make. It’s from one of my favourite sources of inspiring food that works, Ottolenghi. He has shared the recipe for us here. I often tweak the herbs to suit what I’m making. The recipe calls for fresh coriander but here I have used a pinch of dried mint instead. On other occasions I have substituted fennel seeds, fresh parsley or crush cumin seeds. Heat a saucepan over medium heat and warm clarified butter. Add onions and soften. Add garlic and turmeric, add lamb shank to brown on all sides. Pour in a litre of boiling water and lower to a gentle simmer. Cover with lid askew and simmer gently for 90 minutes. Add chickpeas and saffron then continue cooking for another hour. Then add pearl barley and cook for 30 minutes. Lamb should be falling off the bone by this stage. Remove the meat from the bone and discard the bone. Add salt and pepper to taste, parsley and lemon juice. Combine mint and olive oil. Serve hot with greek yoghurt, mint oil, crisp fried onion and yoghurt flatbreads. Gee I’m finding it hard to get back into work this year! Is anyone else having the same problem? or is that a silly question. I don’t know if it’s the glorious beach weather or the fact that I’m so over my job that is causing this. I suspect a bit of both. Quite often I have to eat lunch around 1130am before I go to work and end up having dinner when I get home, anywhere from 730pm -1100pm. So, in summer, these are the dishes I live off, quick fridge and cupboard creations. Yes it’s vegetarian but I make most of my salads that way. If anything a whisper of shredded chicken or if you want to make it even more substantial some pan fried lamb fillet would work well. Put pearl barley in a small saucepan, cover with water so it’s about an inch above the barley and bring to boil on the stovetop. Reduce to a simmer for 12-15 minutes until cooked but still retaining some bite. 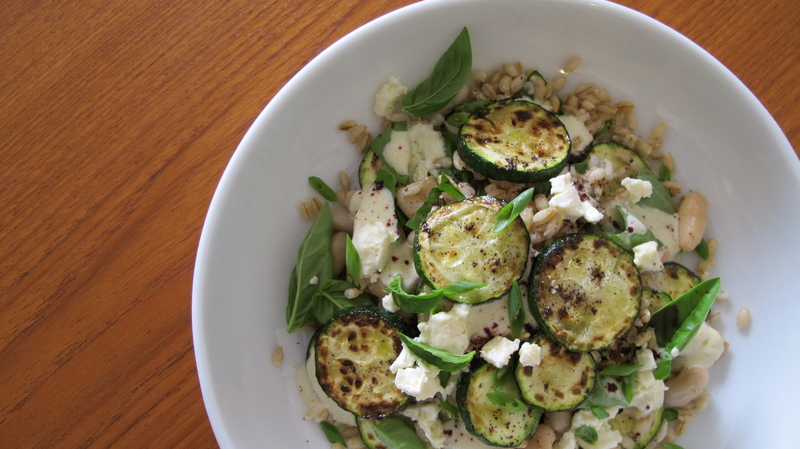 While the pearl barley is cooking, slice the courgette. Lightly oil (I used spray) a med-hot pan and lay courgette in a single layer. Lightly oil the side facing up while in the pan and add salt and pepper. Turn then over when lightly browned. Don’t cook the courgette to a mush, you want them to be lightly browned and just cooked through. Mix all the dressing ingredients together in a small bowl. Adjust to taste. To assemble scatter half the drained pearl barley in your dish, top with half your spring onions, and half your white beans, lay some courgettes over top, and repeat. Top with basil leaves, a small amount of crumbled fetta, dollop a few teaspoons of the dressing around and sprinkle with ground pepperberries. If you don’t like a dairy overload you can choose either the fetta or dressing but I like a little of both. The dressing will keep for two weeks in the fridge. It’s great on other salads too.